The LRC is excited to announce the following talk discussing work by Damir Cavar, Malgorzata E. Cavar, Dov-Ber Kerler, and Anya Quilitzsch from Indiana University. 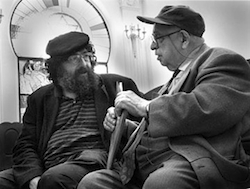 We describe a project to create Yiddish speech and language resources to be able to generate technologies to enable automatic transcription and annotation of spoken Yiddish audio and video recordings, in particular the AHEYM corpus of recorded interviews with Yiddish speakers in Eastern Europe. To the best of our knowledge, this is the first attempt to create a speech corpus and speech technologies for Yiddish, and the first attempt to work out speech and language technologies to transcribe and translate a large collection of Yiddish spoken language resources. Our project aims at the development of resources and technologies that can make the entire AHEYM corpus and other Yiddish resources more accessible to not only the community of Yiddish speakers or linguists, but also historians and experts from other disciplines and general public.